High-tech electronic: Ram Rider, kitted out in EL Wire gets ready to perform. Music producer Ram Rider’s first encounter with any sort of computer came when, during the 1980s his parents bought something called an MSX while he was in elementary school. He would plug the early home computer into a TV and fiddle around with the various programs. That’s how he got into making his own songs. Those youthful efforts helped Ram Rider develop into one of the better young producers in Japan today. He makes high-energy electronic music similar to that of his friend Yasutaka Nakata (who produces Perfume and Asobi System stablemate Kyary Pamyu Pamyu), except with a sci-fi edge … and with himself in the lead-vocalist spot. He’s remixed some of the biggest names in J-pop and has worked with up-and-coming artists, including the Tempura Kidz. He has his eyes set on international success. Since then, Ram Rider has been plenty busy. He’s released three full-length albums, two of which came out last year (one was a solo effort, the other included guests such as Orange Range and MEG). He’s also continues to do remixes and keeps busy with a weekly Internet show, Audio Galaxy, which features his favorite music streamed every Tuesday at 10 p.m.
Late last year, Ram Rider handled the production and lyrics for the Tempura Kidz song “Cider Cider.” The words, he says, aren’t particularly meaningful, as he just wanted to capture the experience of drinking the titular beverage. When constructing the track’s post-Perfume blasts of high-energy electronics, he says he wanted it to sound good to all audiences, from kids to adults. Ram Rider is particularly adept at making sure everyone enjoys what he does, especially in concert. 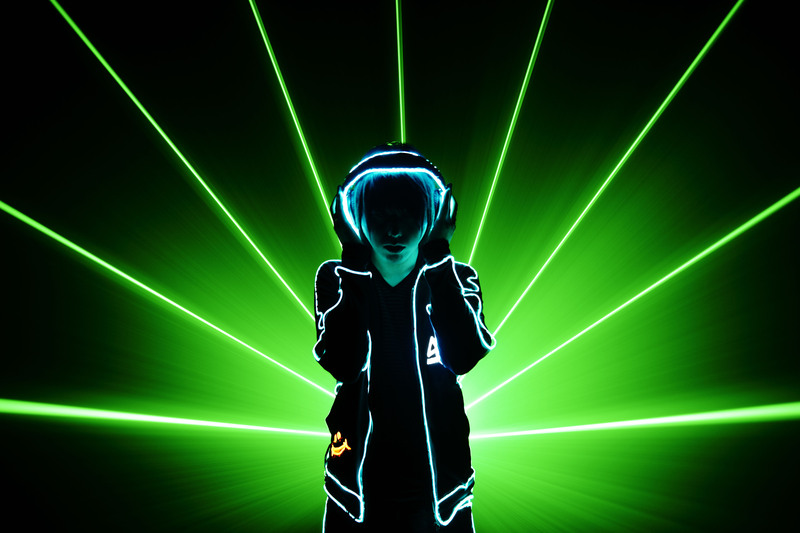 He and his four live-show bandmates wear clothes wrapped in EL Wire, luminescent electronic tubing favored by car enthusiasts. 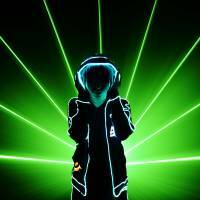 Ram Rider will be taking his glow-in-the-dark show to the United States in July, when he plays the Los Angeles Anime Expo. He’s come a long way from a kid goofing around with music programs on his computer. For more information, visit www.ramrider.com.